Here’s a little known truth about New York State: it is all naturally beautiful. If there is ugliness, like certain parts of the Bronx, it is entirely manmade. Tourists whose idea of visiting New York State might include just the city and Niagara Falls have no idea what else they are missing elsewhere in the state. It is a lushly green state, mostly full of gentle hills, babbling brooks, wineries and bucolic lakes. It also has serious mountains, only a few of which are actually poke above the tree line. The most serious mountains are to be found in the Adirondack Mountains in the far northern parts of the state. Curiously many New Yorkers never visit the Adirondacks. New York Governor Cuomo and New York City Mayor Bloomberg made a point of visiting the park recently to go whitewater rafting down one of its rivers, mainly to educate New Yorkers on this treasure in their own state. Until last week I had never visited the Adirondacks either and I lived in the state for the first fifteen years of my life. As a final destination for our vacation, we spent two nights in Lake Placid in the northern Adirondacks. The village was twice the host of the Winter Olympics, most recently in 1980. The sports complexes are still there and are still being used to train athletes, not just for the Olympics, but for all sorts of sporting contests, not all of them winter related. On most nights you can catch a 7 PM show at the skating arena and for a modest cost watch skaters practice on the rink, yes even in August. Unfortunately we arrived at 7:30 PM, so we gave it a pass. 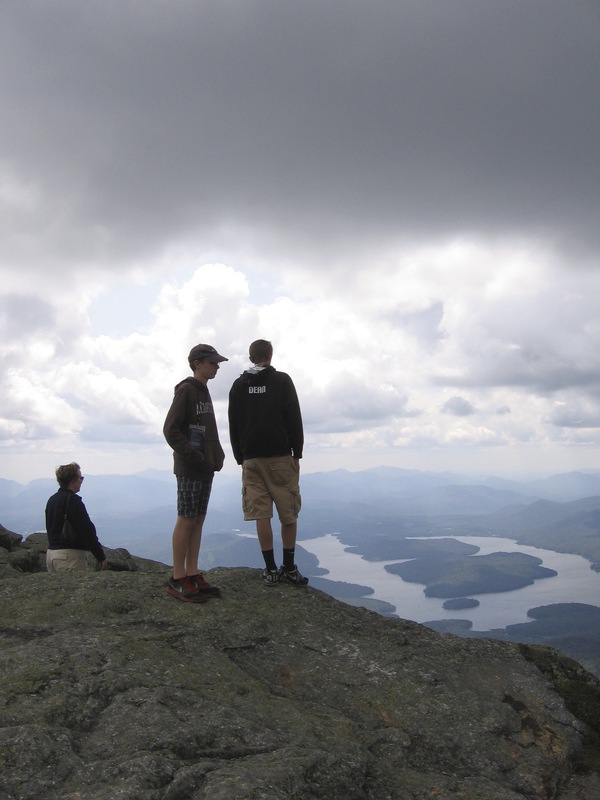 Most people associate the Adirondacks with the Appalachian Mountains. This is not correct. The Adirondacks constitute the southern tip of a larger Canadian mountain range, the Laurentian Mountains of Quebec. The Adirondacks Park is actually a huge area of New York State, a total of 6.1 million acres covering much of the land between Albany and Montreal. The area is mostly natural. There certainly are scattered villages like Lake Placid in the park, but nothing in the way of a city, although there are many townships. Arguably, Lake Placid is the center of civilization within the park. Today it is a mixture of sports facilities, restaurants, boutiques and overpriced lodgings for the rich and well-moneyed. Lining the shores of Lake Placid are all sorts of “camps”, which in reality are houses with lakefront access, most of which are large and ornate. Only a few of these are accessible by road, which means effectively these estates can only be used during the summer when the lake is not iced over. Everything must be hauled in by boat, including construction equipment. Garages back out to the lake and are for boats, not cars. Even if you are independently wealthy, there are no more sites on the lake to build your camp. The best you can hope for is that someone puts their property on the market. It’s an exclusive neighborhood that includes summer homes for famous people, generally CEOs of large corporations, although a few celebrities also have had “camps” on the lake. The famous singer Kate Smith had an estate on the lake. Getting anywhere in the Adirondacks takes a lot of time and generally requires a car. However, the park attracts athletes and outdoor enthusiasts. These people have no problem arriving by bike, even if the journey requires hundreds of miles. They are not the least bit intimidated by its many hills and mountains. The park accommodates bicyclists by putting bike lanes on the shoulders of all the major roads. As you might expect, ski enthusiasts find much to love about the park. There are many mountains in the park, but Mount Whiteface northeast of Lake Placid is a principle place to go skiing, not just because it is the sixth tallest mountain (4867 feet) in the park but because it has the longest ski lift and ski slopes east of the Rockies, more than three thousand feet in total elevation. The mountain is named not because of the snow often on its slopes but for the exposed seams of white granite on its face. We took a gondola ride up the mountain. The ride up takes twenty minutes and you arrive not even near the summit. The ski slopes are severe, so don’t expect much in the way of bunny trails. Do expect on a clear day a breathtaking view, which on the summit can extend all the way up to Montreal. There is a road you can take to get to the summit, with steep inclines and a washboard surface, so ascend slowly. For the adventurous there is a path to the summit from the parking area. For the less adventurous a tunnel takes you to a twenty six story elevator. The Adirondacks is a great natural wonderland, but it is also quite remote. Black fly season is to be avoided but you may find mosquitos any time during the growing season. Villages like Lake Placid have many of the comforts of home, but little in the way of modern conveniences like large supermarkets and Home Depot stores. It makes an excellent place to visit but to actually live there requires a lot of compromises, including long trips to cities like Plattsburgh for essentials or Albany or Montreal to catch a flight. Of course it is also snow country. Winters are long and tend to be cold. You may see snow falling in May. A snow blower is essential. I would not live there without snow tires and a set of chains. If you want to be close to nature, however, these are small tradeoffs. While there are tiny islands of civilization in the park, nature is the default and you cannot help but be imbued by it. 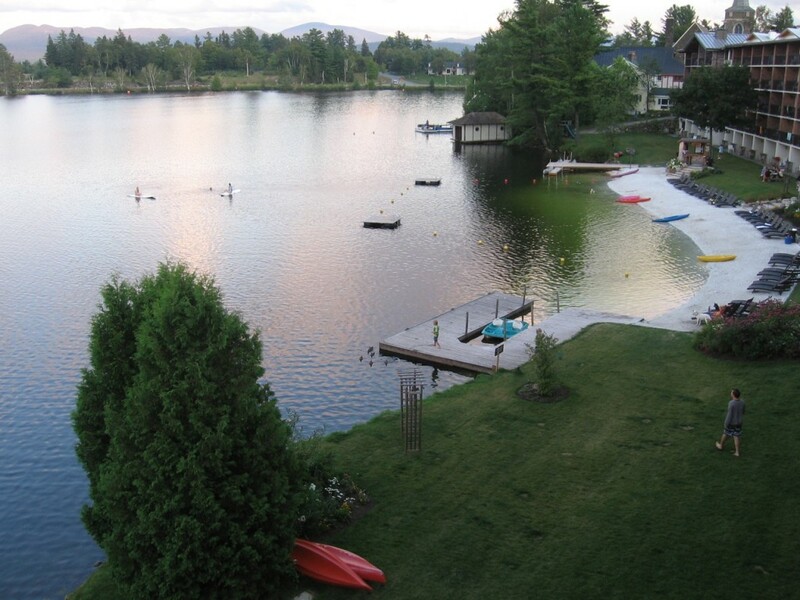 Lake Placid is mostly oriented around the well-moneyed, but those with more modest means can find accommodations. We found a lovely B&B miles from Lake Placid that came with a welcoming proprietress named Aggie (who makes excellent breakfasts; demand the lemon walnut cake) and a friendly dog named Luke. It helps to be athletic because most activities are oriented toward outdoor enthusiasts. But there are more placid activities you can enjoy, like a boat tour of Lake Placid, a serene train ride between Lake Placid and Saranac Lake, window shopping in the boutiques along Main Street or ambling on a local trail. There is upscale dining in Lake Placid as well. In one restaurant we saw a string quartet playing. Its remoteness from the rest of the country was brought home by our return trip home. It was nearly three hours of driving just to get to Albany, and more than ten altogether to get back to our house in Northern Virginia. Do not trust the eight hours and six minutes Google Maps told us it would take if we took the New Jersey Turnpike. It did not account for massive construction on the turnpike and the minor fact that I-95 is not really engineered for the volume of traffic it gets. In parts of New Jersey, it is still two lanes in each direction. Traffic delays added ninety minutes to our trip. Lesson learned. Take the serene and nearly empty I-88 between Albany and Binghamton instead, then I-81 south. Not only will you avoid a lot of traffic, but you will save yourself about thirty dollars in tolls. So much for our 2013 vacation. I hope that you enjoyed the travelogue.